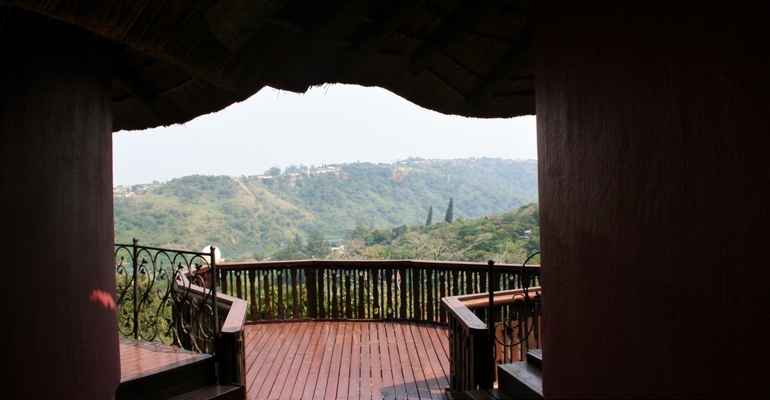 Nestled in the Umtamvuna valley with a view over the river, Hlabelela Backpacker Lodge comes equipped with two large self-catering units, capable of sleeping 6 and 8 guests each, and two smaller on suite units. The laid-back atmosphere really inspires relaxing moods and chilled out afternoons by the pool. Although the interior of the buildings are equally as ambient, each one is unique but comfortable and affordable. As long as your pets are friendly, ours are too, just enquire first. This incredible little Backpackers Lodge was built with an eye for the surreal. Inspired by the architects who are able to blend nature with modern comfort, this Gaudi-esque collection of thatched homes is as beautiful as it is unique. Only a short drive away from the Old Pont, the Umtamvuna Nature Reserve, Port Edward’s main swimming beach, and literally on the doorstep of the Red Desert reserve, this beautiful lodge has all the benefits of the surrounding nature with an added bonus of being close to a selection of shops, restaurants and many more.